ObamaCare’s not working. And ya know who the “real” victims of this are? Well, that’s easy: the same “real” victims of 9/11, according to the mainstream media: Muslims. Both of Detroit’s major newspapers–the Detroit Free Halal Press and The Detroit Newsistan–want you to know that ObamaCare is not working . . . FOR MUSLIMS. Yesterday, the front pages of both and their extensive coverage of Day One of ObamaCare showed us that it took not just one, but THREE(!) Muslim advisors to help a fellow Hezbollah-supporting Muslima not get through on the ObamaCare hotline. You see, Dearbornistan Heights Muslim chick Fatme Cheaito, of the Shi’ite Muslim Cheaito family (they also spell it, “Cheayto,” to avoid detection) whose used car dealership was shut down by the DEA for helping finance Hezbollah, went to the Muslim welfare agency, ACCESS, to help her and her son, Ali, take advantage of the infidel ObamaCare system. And not one–but THREE Shi’ite Muslim “navigators” tried, and failed, to get her ObamaCare access. As I’ve told you before, ACCESS–the tax-funded Arab Community Center for Economic and Social Services–gets millions from the federal and Michigan governments and has used that money to train Al-Qaeda terrorists and help them get commercial drivers licenses and Hazardous Materials Hauling Certificates; to fund the anti-Israel Divestment Conference at the University of Michigan; to harbor and help shield Muslim illegal aliens (including terrorists) in the United States; and to aid and abet pregnant Muslim aliens in birthright citizenship for their children, all while defrauding Medicaid. 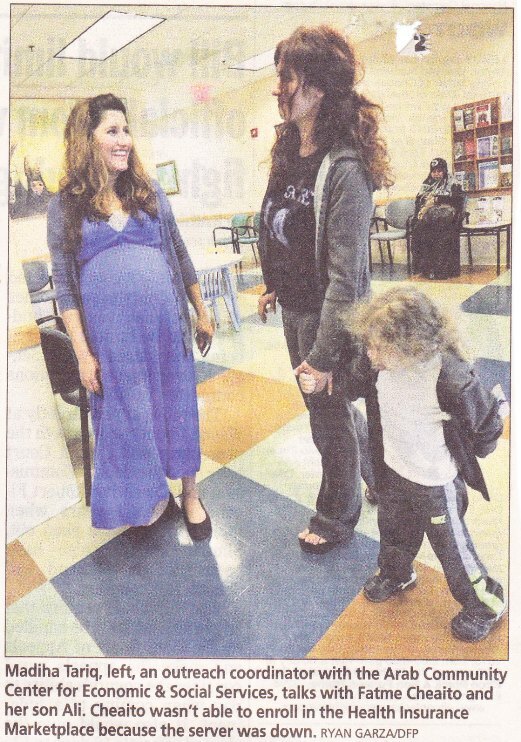 Check out these photos from the Detroit newspapers. 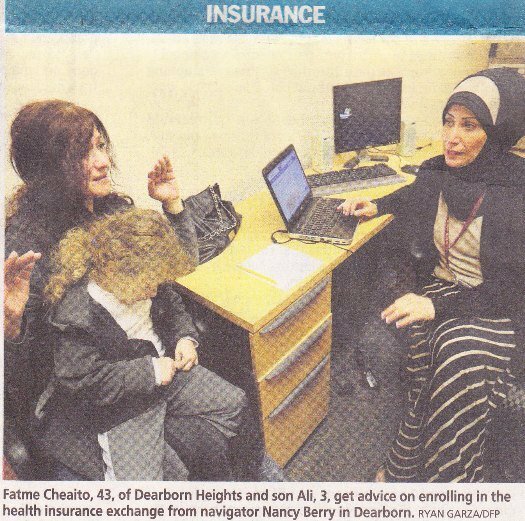 First, there is Fatme Cheaito and son, Ali, trying to get ObamaCare from fellow Shi’ite Muslim Hezbollah fan, Nancy Berry, on the front page of the Detroit Free Press. Then, there is there is Fatme Cheaito and son, Ali, trying to get ObamaCare from fellow Islamic terrorism supporter, Madiha Tariq. And, then, there is Fatme Cheaito and son, Ali, trying to get ObamaCare from fellow Shi’ite Muslim Hezbollah fan, Al Baalbaki (Baalbek, from where his family clearly emanates, is a Hezbollah stronghold where pot is grown). Hmmm . . . I think I feel a “How Many Tax-Subsidized Muslims Does It Take to Screw In a Broken Light Bulb?” joke coming on. Dozens of uninsured men and women in Dearborn filled waiting rooms this morning at ACCESS, a community organization that is providing free navigation help with the government’s website for buying insurance policies — www.healthcare.gov. But nearly every attempt Tuesday morning to pull up the website resulted in error messages, said Dr. Adnan Hammad [DS: an openly anti-Israel Palestinian Muslim who is a fan of HAMAS and Hezbollah], a director for the Dearborn-based group, formally known as the Arab Community Center for Economic & Social Services. The organization could provide the visitors with general information on the health care offerings and determine their eligibility based on income and family size. But few people could actually sign up for coverage due to the non-functioning website. 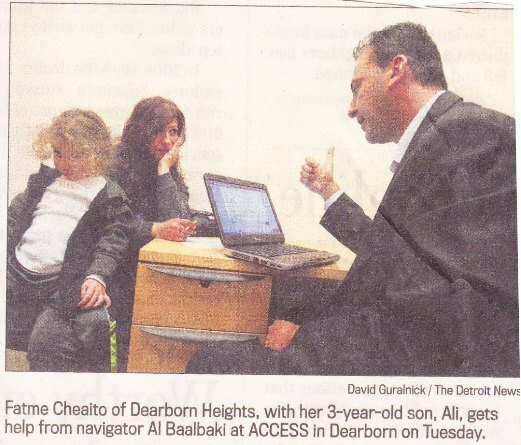 “We will call them once this website opens again and we’ll go from there,” Hammad said. . . .
Fatme Cheaito, 43, of Dearborn Heights, sat down Tuesday with an ACCESS navigator to see what coverage she might qualify for. .
Married with a 3-year-old son, Cheaito conversed in Arabic with her guide and learned she is one of an estimated 320,000 Michiganders who will qualify for Medicaid next year once the state expands the program’s eligibility on April 1. The expansion was part of the Affordable Care Act. Another visitor, Ray Berri, 47, of Dearborn, learned that his wife, Fawzieh Berri, will also qualify for Medicaid through the expansion. The news came as a big relief, as his wife currently pays $150 out-of-pocket for a doctor’s appointment and the family of four’s yearly income is under $18,000. Sure, their income is $18,000 on the books. But how much is it really? Hmmm . . . 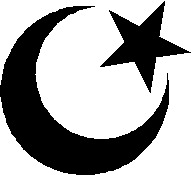 I thought all these Arab Muslim propaganda groups keep telling us that American Muslims are more likely to make a lot of money, own businesses, and contribute to the federal coffers. Don’t believe the hype. The Hezbollah-supporting Cheaitos and Berris (both of which are prominent Hezbollah families in South Lebanon) are all too happy for you to pay for their healthcare entitlements. Hezbo Cha-ching! At the Arab Community Center for Economic and Social Services in Dearborn, dozens of people were in line waiting for help with their applications by the time doors opened Tuesday. Fatme Cheaito of Dearborn Heights showed up at ACCESS twice on Tuesday, hoping to enroll in a plan. The website was down in the morning, so she came back later. Al Baalbaki, a federal navigator, helped her log on to the site, but she was unable to establish an account. “In this case, the market isn’t ready yet,” Baalbaki told the disappointed mother, who cradled her 3-year-old son, Ali, in her arms. But Hezbos are certainly ready to have you pay for their healthcare. Alhamdillullah [praise allah]! 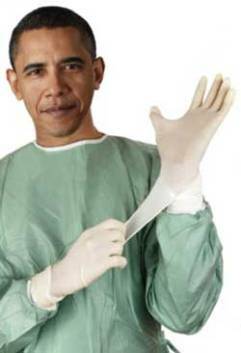 The Muslim-occupied Detroit media wants you to know: ObamaCare: Muslims Hardest Hit! For everyone else, it’s working like gangbusters, right? Yup. And they’ll never say thanks to America for giving them shelter from Sunni jihadists who want to see them dead. Regardless of what sect they are, Muslims feel no real gratitude to America. I’m not terribly upset that it isn’t working right now. At least it will delay handouts to Muslims and others who are shiftless and sponge off the taxpayers that are really contributing something to the economy. While I’m not in favor of massive Government intrusions such as Obamacare, I am more unhappy about the redistribution of income to shiftless bums and loafers, many of whom just have babies to stay on welfare. Do you think that in all the Republican comments criticizing the bureaucratization (which I’m not all that upset about) and Government expansion, we will hear a word about the income distribution of the type that we’ve seen with mortgage handouts, food stamp handouts, college handouts for people who are too dumb to be in college, etc. And the cheating? Of course. It goes on with all Government handouts, welfare, college, etc. So much for reduction of costs by the Government fighting fraud, which we heard so much about a few years ago. It’s funny how the reporters follow Mrs Cheetos around the place and take a picture of her with each person who can’t help her. What is this, a children’s book? That’s just Obama saving or creating jobs. Duh, actually the taxpayers are the hardest hit. It was interesting to read that heaps of these Moooooooslims knew enough to get in line (in great #s) when the CW is that many low-infos are not yet privy to the ACA (ObamaPutinCare) even now. These Mooooslims, like Alinksy-ites, know how to use the US Gubmint to tear it down and hoist it by it’s own petard. I like to keep an eye on that aspect the more I learn about Islam and Mooooooslims. Good luck with that European health care system you thought would look good on you. Suckers.There should be a special word for fools who don’t even know when they’re on to a good thing. Fawzieh Berri??!?!!!?? Is that a real name? Wasn’t there a cartoon a long time ago with a character named Fozi Bear? Right on with all the comments here, especially as detailed by Little Al. The big issue is that he is actually describing a larger problem, that of character issues. In this case, it’s the collective character of the American people. It’s no longer mostly righteous. It is now mostly unrighteous. I’m gonna get my piece of the pie, this one does, that one does, why not me? That’s what America is for, right? Actually, it’s wrong, but if we hark back a few years to The Reign of The Great StainMaker, we learned a valuable lesson, that character issues don’t count. His public mouthpiece said so, on behalf of that “administration.” And we know from the Bible, that when the leaders cast off all restraint, the people are bound to run wild. So, here we are, no more heroes, no more Reagans, no more true conservatism, constitutionalists and small government, strong national defense types being labeled as “far right extremists” and radicals. Bye, bye, America, enjoy your lunch time Halal lamb from the food cart swine vendors on NYC street corners. You’ll be choking on it soon enough, as you lament the demise of . . .
Was it ever really all that great? If it was, this would not have happened. People in a truly great society could not be indoctrinated in this fashion. Despite the 100 year push, a truly great society would not have allowed this. Too many ideological enemies within to begin with, and now too many enemies within to recover. It’s a full time job getting free stuff. So much to do, so many people to see, so many forms to fill in………no time to work.